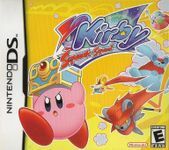 Float, jump, and battle through eight huge worlds as Kirby takes on a diabolical band of rodent robbers called the Squeaks! Mix, match, and make new abilities and items using the Touch Screen. Over 25 upgradeable abilities, including new ones like Animal, Bubble, and more! Change the world! Use Kirby's abilities to burn grass, freeze water, and alter the environment. Play multiplayer sub-games over local wireless.